John Warfield Dunkle, 30, died at his home in Danbury, Connecticut, on June 29, 2011, following a brief illness. Born September 8, 1980, in State College, Pennsylvania, John moved with his parents to Boston in 1983 and to Danbury in 1984. He graduated from Danbury High School in 1999 and attended Western Connecticut State University, where he majored in biology. At his death, he was a computer programmer who specialized in creating games and business applications for mobile phones. John is survived by his parents, Terry and Mary Dunkle, of Danbury, and two brothers: William, of Brooklyn, N.Y., and Thomas, a student at the University of Connecticut. He is also survived by his fraternal grandmother, Donna Francis, of South Burlington, Vermont, as well as numerous aunts, uncles and cousins. Friends and family are invited to a viewing at the Jowdy-Kane Funeral Home, 9 Granville Avenue, Danbury, from 5 to 8 p.m. on Tuesday, July 5. A celebration of John’s life will take place at King Street United Church of Christ, 201 S. King Street, Danbury, at 6:30 p.m. on Wednesday, July 6. The Rev. Dr. Patricia A. Nicholas will officiate. John had many friends, and cared deeply about them. His family has asked anyone who knew John to share memories and photos on his Facebook page at http://www.facebook.com/#!/profile.php?id=100000206761631. In lieu of flowers, donations may be made to the Travel Abroad Scholarship Fund at Danbury High School, 53 Clapboard Ridge Road, Danbury, CT 06811. 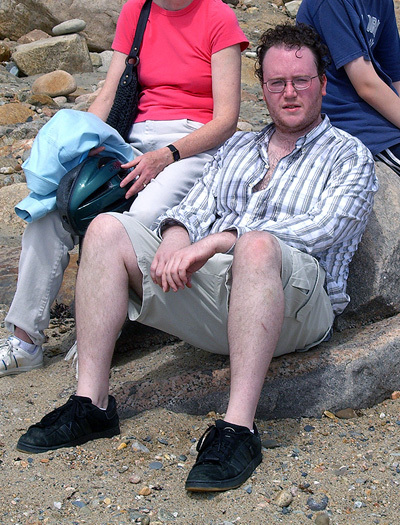 Here, John relaxes on the beach at Block Island on August 23, 2007. 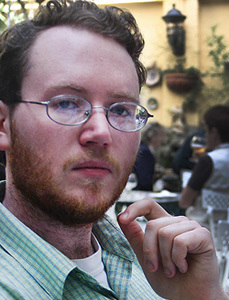 He loved the outdoors, books, movies, music, and debating with friends in his computernetwork,where his nickname was Occlusian -- deliberately misspelled. John had a gift for cooking, and delighted his family and friends with concoctions made of the simplest ingredients. Thanks to his eclectic reading, he was the natural choice for settling an argument over a point of history, medicine, science, or popular culture. He always knew the best movie to show at a holiday get-together. One of his favorites was "The Big Lebowski." John also loved dogs -- especially his own Charlie the Rat Terrier, for whom he made toys out of old socks and ropes that excited the animal far more than any commercial playthings that the family brought home. John usually took Charlie along with him on errands. Friends about town will miss the sight of John at the wheel with Charlie riding shotgun.